It was a spur of the moment decision, a funny photo Nick Bonino decided to snap, and one he had no intention of posting on Twitter. Then he did. And that’s when the hockey world took notice. If you haven’t seen the picture of Kali, the miniature Australian Shepherd wearing a Pittsburgh Penguins home jersey along with a pair of hockey gloves, then you might be in the minority. The photo, which went viral on the afternoon of August 4, has proved to be a big hit on social media, ‘favourited’ nearly 1.5 thousand times on Twitter. As of now, there are no plans for future photo sessions featuring the unofficial Penguins mascot that Bonino and his wife Lauren brought into their lives two and a half years ago. “I really wanted a dog,” recalled the Connecticut native. “I got an itch. And when that happens, I’m pretty relentless. My wife thought it might not be right at the time, so I decided to give the cold shoulder for a couple of days. Then, we decided to go look and we found a great place. The trio recently had plenty of time to spend together, specifically, a cross-countries trek, from British Columbia to Connecticut. Just like she did when it came to her crowd-pleasing photo op. 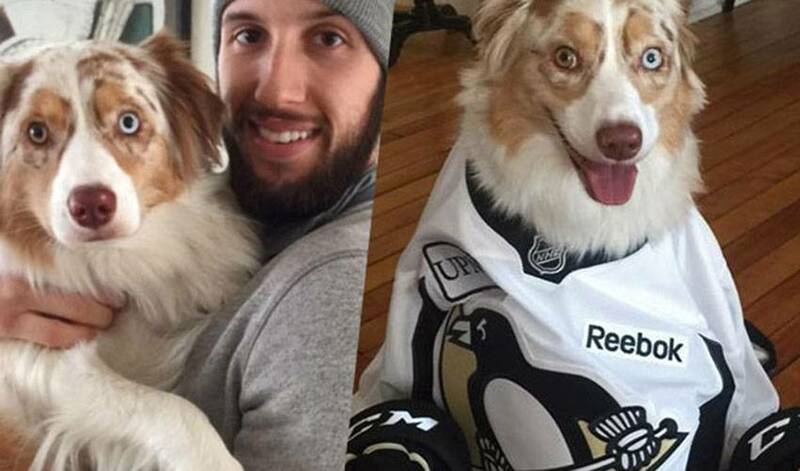 Bonino, in the midst of making his daily breakfast of toast, tomato, avocado, mayonnaise and a fried egg on top, has no desire of trying to rival his dog for Twitter bragging rights. While that means no ‘Breakfast with Nick Bonino’ photos hitting the Internet, another appearance by Kali is not out of the question. Maybe one of her in a Pittsburgh away jersey, wearing a helmet? You just never know.